Rediff.com » Getahead » Malaika's moves will set your core on fire! Malaika's moves will set your core on fire! 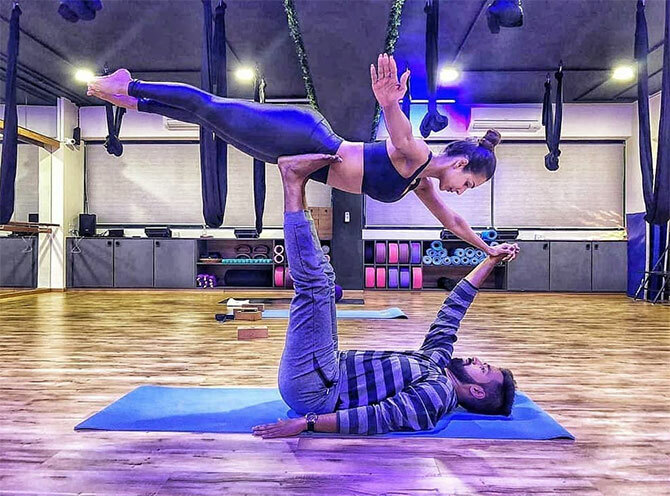 Malaika Arora is the newest fan of acroyoga, which combines the best of yoga and acrobatics. There's no denying that Malaika Arora has a incredible body -- probably one of the best in B-Town. A fitness diva, she has an age-defying bod that any woman would love to have. In the past, she has revealed that yoga and gym workouts are the secrets to her lithe physique. But she has developed a new obsession that's taking the Internet by storm. 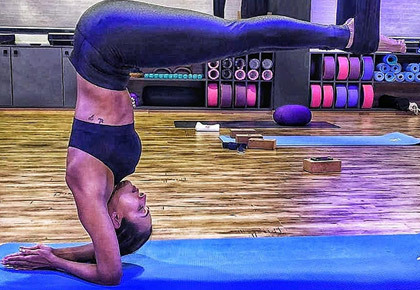 The mom of one has been doing acroyoga off late, and if her pics on Instagram are anything to go by, this new form of yoga seems like a trend that's here to stay. Scroll down to see some of her pics. That's not an easy pose to master. It requires balance, core strength and some incredible focus. Way to go Malaika! Meet her new buddies and 'partners in crime': Jahnavi Patwardhan, Malaika, Sarvesh Shashi and Akansha Ranjan Kapoor. Striking an effortless pose with Sneha Meghe.